Everyone knows Trek is a world leader in mountain bike technology. They produce some of the most technologically advanced mountain bikes on the market. Each platform is a leader in its class and is loaded with features and details that will make any ride, on any trail, better. Take the Dual Sport for example. A nimble hybrid with suspension, extra tread, and a moderate position for people who want the freedom to ride everywhere. If you can only have one bike, you want to get a dual sport. Sure, they get you from point A to point B faster than most other bikes, but there is so much more to this line! Related: Need help choosing your first mountain bike? Check out this post! SO much more, that it's hard to believe that these Gary Fisher collection bikes start at such a low price, with the quality they provide. There is such attention payed to detail like: the color-matched fork and ferruels on the cables. 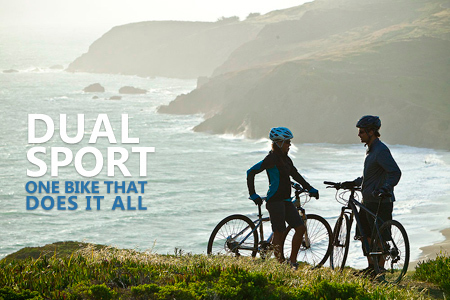 They ride smooth, and help you find your love for adventure. Fast on the road to get you where you need to go: work, school, or other, yet has capable suspension and offers a confident ride on trails. Take your inner mountain biker out once in a while, with massive tire clearance on this bike you will be able to use tires as big as XDX 29"x1.8" MTB tires (without fenders). This light, strong frame is rack and fender ready, and is plenty equipped to do some weekend warrior trail riding! It's clear that hydroforming isn't just for show and the frame is stiffer and lighter for it. Trek begins the lineup with the 8.1 DS. Alpha Gold Aluminum, using manipulated tube shapes to balance strength and weight saving. 21 Speeds and easily accomodates 700x35c tires with fenders or up to an XDX 29"1.8" MTB tires without fenders. The 8.1 and all other Dual Sport bikes also come Bontrager saddles and bars to ensure complete comfort no matter how long you ride. The 8.2 DS receives a shock-absorbing suspension fork that allows the front wheel to travel up and down over bumps while the handlebars stay steady, for a comfortable, controlled ride. Now we start moving into the big leagues with the 8.3. It comes with a nice upgrade to a Shimano Acera crank and rear derailleur, and is also outfitted with mechanical disc brakes. It's SR Suntour NEX MLO front fork is preload adjustable with lockout and has 63 mm of travel. You can expect this fork to deliver smooth riding and nimble handling over even the most potholed roads and bumpiest paths.. The next step is the 8.4 and which means you get an upgraded Alivio crank, Shimano Deore rear derailleur, and Bontrager Satellite Elite ergonomic grips. You jump up to 27 speeds on this model, ensuring you always have the right gear on the road. The 8.5 is doing a great job as the second best bike in this lineup, boasting a fantastic Shimano SLX rear derailleur and Shimano hydraulic disc brakes that provide ultimate control and stopping power. All hail the 2013 Trek 8.6 DS. It is the ultimate two-in-one bike. Trek's proprietary IsoZone frame gives suspension that is built in to the frame. Your suspension lockout is remote controlled by a lever on the handlebar, making the 8.6 one of the best of the Gary Fisher Collection. Return to the simple joy of cycling with a go-anywhere, fast, lightweight hybrid bike from Trek. Commute on it, ride it on the road, ride it on bike paths, no matter where you ride, you'll have fun! Take the long way home. what kind of weights are these bikes? The best good thing about any hitch attach motorbike stand will be the funds it will save you about fuel. Some sort of motorbike with a ceiling stand results in get as well as significantly eliminates your current gasoline consumption. Some sort of rear transported motorbike won't create the same type of get, for more information click here the bike rack guide. If you are exploring the choice of shopping for hybrid variety of bikes, - based mostly or otherwise, here's some belongings you got to understand before committing to buy coolcycling.net. It most popular article about mountain bike. I think you are a good writer about mountain bikes. Some people deserve great, some people win constantly, but there are always the books that come to the top. https://www.jetwin.com/en-us/sports learn here more about sportbook. Bikeworks Carnival is Only 8 Days Away! 2013 Madone 7.0 Aero Road Bike at Bikeworks!